Green Noise is a landscape study consisting of several works of art. The Background Noise of the World is a sound piece/performance carried out by a farmer reading his crop. An IR-sensor on top of the tractor does a reading of the green colour of the field every second and in this art work the reading is translated in real time to sound that is played from speakers mounted on the tractor. Other works in this series are Reflectance of Green and Silent Green 91.13. Reflectance of Green is an interpretation of the landscape translated into a grid of green squares, where the nuances are linked to the reading by the farmer's IR-sensor and is updated every second. The reading of the field is printed as a book, which is also part of the piece. 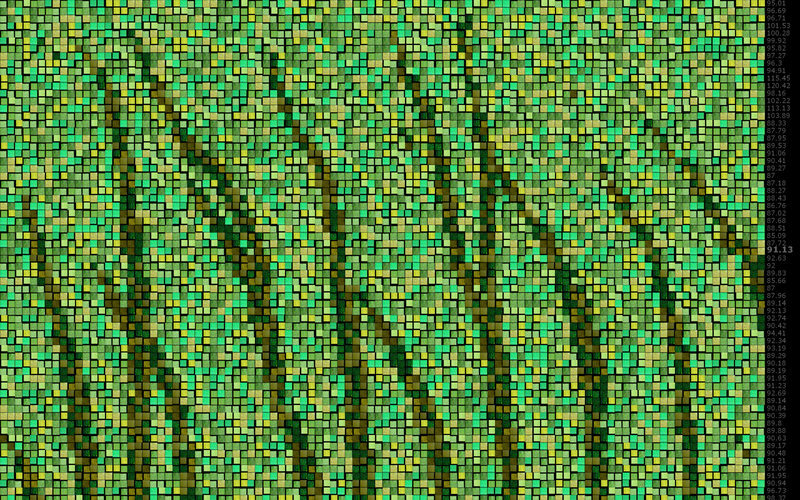 Silent Green 91.13 is a C-print, where the flowing motion from Reflectance of Green has stopped and one second of the field has been extracted from the stream of data.